Info: Transformers Universe is a third-person action-based MOBA developed by Jagex. 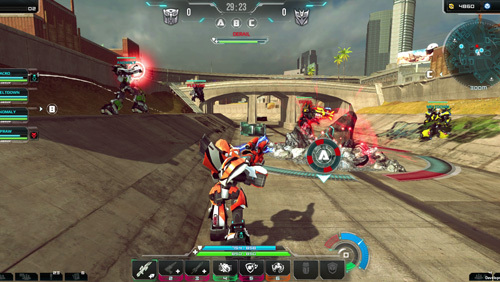 In the game, you take control of an ever expanding squad of Transformers in heated battles of skill across multiple maps and game modes. With a range of customization available in the form of weapons, armour and powercores, each one of these unique Transformers warriors can be modified to match your playing style. As a commander of your chosen side, you have an important role to play in the faction war. You will encounter multiple battle scenarios, each with its challenges and tactical advantages. Learn these, and get the upper hand on the opposing faction. All of your efforts on the battlefield – whether successes or failures – count not only for individual honors, but also towards the overall standing of your faction. This is not just about winning the battle; it’s about shaping the war. As you strengthen your battlegroup , you will be able to engineer your warriors to fit your newly-learned tactics. Make strong bonds with fellow commanders, learn to utilize your skills, and choose who will work best in your team in each battle you face. Earn distinctions, medals and achievements based on how well you perform in each battle. Destroy three enemies in one hit or be the best supporter in your team, and you will be recognized – or even awarded a medal – for your skills. Command your squad of specialist warriors – pick from your collection and choose the right warrior to suit your combat style. Work together with your team to compliment skills and overpower enemy forces efficiently. Upgrade and repair your warriors – customize how your warriors look, feel and perform with remodels, hundreds of equipment improvements and powerful upgrades.